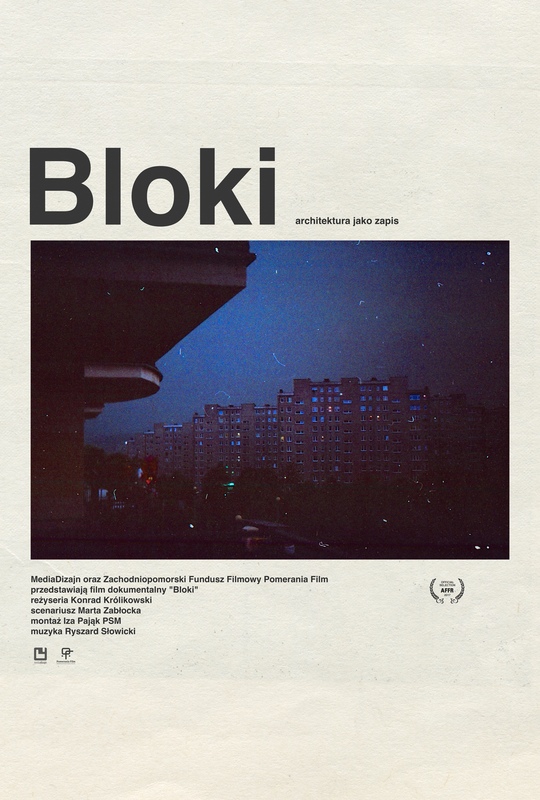 "Bloki" [Blocks] is the first feature-length, broad and multifaceted production devoted to housing construction in Poland from 1956 until today. It is, inter alia, a combination of interviews with architects - who designed famous complexes of blocks of flats [in Polish referred to as “bloki”] in Poland - people living in them, architecture critics, and historians. Yet, the film is not only about architecture. For decades “bloki” were viewed differently by consecutive generations of Poles; first as a symbol of desire then as a place you want to escape from. In the film they are presented as witnesses and signs of huge transformations experienced by the country after the war. Before the screening, Błażej Ciarkowski, Ph.D., Eng., architect will introduce the audience into the Łódź context of gigantic complexes of blocks of flats: when and how they came about? who designed them? what problems they resolved and what problems they created? There is nothing like a uniform pattern of “bloki”. The term encompasses the traditionally constructed housing complex named after Włada Bytomska and located in the area of the city called Doły and Widzew-Wschód (East Widzew) complex built of prefabricated elements (the so called “big panel blocks”); the complex of Teofilów situated at the outskirts of the city and Manhattan in the heart of Łódź; blocks of flats loosely disperssed and nicely fitting the green surroundings in the area of Kurak and the so called “infills”, blocks of flats inserted between the existing structures in Piotrkowska Street. However, they have one thing in common: all of them were built under communist rule (PRL) and emerged from the modernist idea of a flat that would be available to every family. In the past, having an “m” (the short for “mieszkanie” meaning “flat” in Polish) in a block of flats was everyone´s dream. Over time, the dream was replaced first with the one about a house with a garden and most recently with a dream about living in an apartment house at the outskirts of the city. For many years prophecies are being heard that the blocks made of prefabricated elements will fall into pieces like a house of cards. Yet, not only are they still there but increasingly more often we see them as part of our cultural heritage. Błażej Ciarkowski – Ph.D., Eng., architect. Studied architecture at the Łódź University of Technology and history of art at the University of Łódź. In 2012 he defended his doctoral thesis with distinction and received the Ph. D. title in technical sciences as an architect and urban planner. Since 2017 a lecturer at the Institute of Architecture and Urban Planning at the Łódź University of Technology. Previously, since 2012 he lectured at the Department of Art History at the University of Łódź. Awarded with the prize of the Marshal of the Lodz Voivodeship for the best doctoral dissertation on Łódź -related subject. His research interests focus on postwar Polish and world architecture, liaisons of politics and architecture, as well as the protection and conservation of modernist heritage. Author of the following books: “Bolesław Kardaszewski. Architektura i polityka” [Boleslaw Kardaszewski. Architecture and Politics], “Łódź, która nie powstała”[Lodz which was never built], “Odcienie szarości. Architekci i polityka w PRL-u” [Shades of Grey: Architects and Politics in PRL] and a number of research and pop-science papers. Currently working on the publication on the architecture typical of postwar leisure centres and on a book “Miastoprojektanci. Łódzcy architekci czasów PRL-u” [Citydesigners. Lodz Architects of the PRLTimes].